Happy Monday everyone! 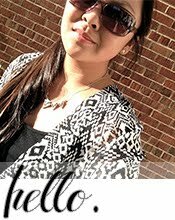 A few days ago, I had the honor of guest posting for Dollar Store Crafts! Since the weather is warming up, I did a step-by-step tutorial for a dollhouse charcoal grill. Isn't it adorable?! I used a plastic container from one of those toy machines outside of every store. You can get the full list of materials and the photo instructions here. My 11 year old little girl will love this! So cute! Hello Lindsey! 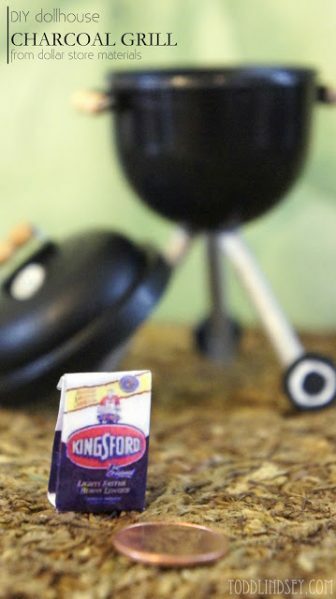 Your little kettle Bar B Que is Adorable! Well done! This is wonderful! I hopped over from Dollar Store Crafts. I love dollhouses and have wanted one for a long time but unfortunately now is not the time to start one. Do you read The Bloggess? She has made a Haunted Dollhouse. It is really something to see. Thanks so much for the awesome guest post. 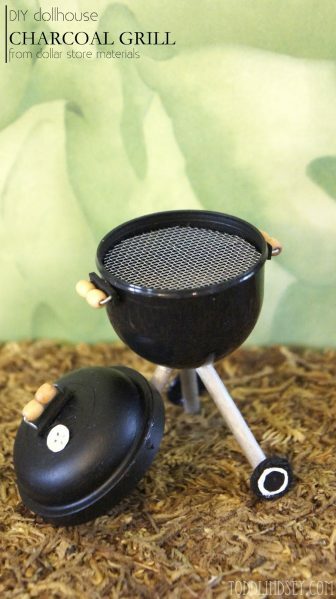 Your dollhouse BBQ is genius! OMGosh brilliant. A the patience to make small things, you got me there girl!